Drew H. of South Dakota sent in this picture of his new build. Here are the components he used. 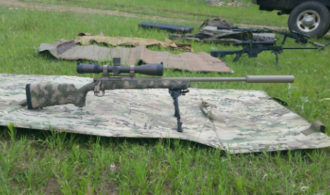 Rem/Age 6.5×47 Lapua Criterion barrel, Remington 700 short action, HS prescision stock with DBM, Calving Elite trigger at 1.5lbs, Night Force 30 moa base, Vortex 35mm match precision rings, Vortex Razor 5-20 ffp ERB mil scope, Harris bipod, lane Scorpion King magnum can, Cerakote fde.